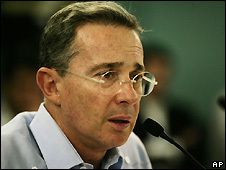 A cousin and key ally of Colombian President Alvaro Uribe has been arrested over alleged ties to paramilitary groups. Mario Uribe Escobar, who stepped down as a senator last October, denies accusations of criminal conspiracy. He went to the Costa Rican embassy in Bogota seeking asylum, but his request was turned down. As he left the embassy, he was taken into custody and driven away in a police jeep. Mario Uribe is one of the most prominent figures arrested over alleged paramilitary links. A jailed former paramilitary leader, Salvatore Mancuso, has alleged that he met Mario Uribe several times and was asked by him to support his senate campaign in 2002. Former paramilitary commanders have also testified that militias reached agreement with him to help him take over farmland. A statement from the prosecutor's office accused Mario Uribe of entering into "agreements to promote illegal armed groups," the Associated Press news agency said. "The arrest warrant for Senator Mario Uribe hurts me, but it is a pain I will accept with patriotism and without avoiding the fulfilment of my responsibilities," said President Uribe, shortly before his cousin was detained. Mr Uribe went to the Costa Rican embassy shortly after the arrest warrant had been issued. 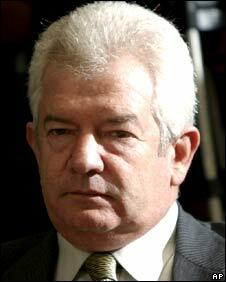 But the Costa Rican foreign ministry said it would be "inappropriate to grant asylum to Mario Uribe." To date, inquiries have been opened into dozens of current or former members of congress over their alleged ties to the United Self-defence Forces of Colombia (AUC) paramilitaries in what has been dubbed the "parapolitics" scandal. Most of those being investigated are allies of President Uribe. The president remains popular, however, for overseeing aggressive military action against leftist rebels. He also negotiated the 2003 peace deal that saw paramilitary leaders surrender and demobilise 31,000 of their men in exchange for reduced jail terms and protection from extradition. The right-wing militias were created by landowners and drug-traffickers to combat left-wing rebels and anyone suspected of being a sympathiser. The paramilitary groups, including the AUC, and the leftist rebels are listed by the US and the European Union as terrorist organisations.